2.) Hollywood Party. 1934. "Musical comedy hodgepodge built around screen star Jimmy Durante throwing a gala party." 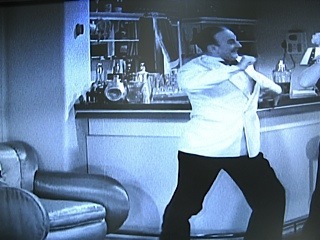 The Lighthouse Cocktail shaker is on the bar in the classic egg-breaking sequence w/ Stan Laurel, Oliver Hardy, and Lupe Velez. This segment is easily found on you tube. 3.) Riptide. 1934. A big budget pre-code movie Starring Norma Shearer wearing more than one very revealing gown which only pre-code production values would have permitted. The reappearance of an old flame complicates the staid marriage of a lively ex-chorus girl to a British diplomat. 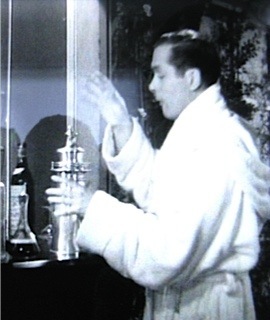 The Lighthouse Cocktail Shaker is used to shake and pour a Martini by the old flame, Robert Montgomery for Shearer. 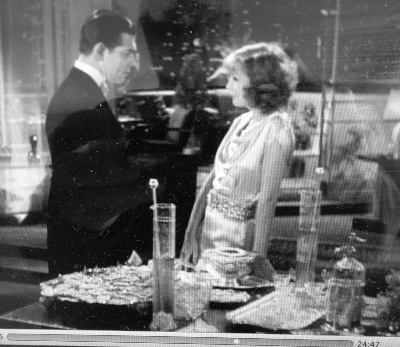 MGM emptied their prop house of bar ware for this one, in one scene in the suite of Robert Montgomery you can spot: The Hawks party size mixer, page 141, w/ long glass stirring rod that has a sterling silver top knob and strainer, The Manning Bowman K128 mixer, page 60, various decanters, seltzer & bitter bottles, glasses, ice bucket, and an unidentified cut glass cocktail shaker on the table top next to a lamp. 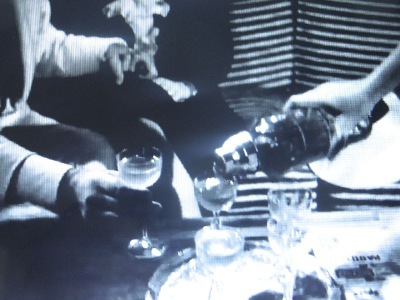 There is imbibing in almost every scene, in a Cannes bar Shearer and Montgomery both order French 75s and behind the bar you can spot an unidentified large party size tea pot style plated cocktail shaker and next to that a repousse tea pot style International Silver cocktail shaker re; page 42. 4.) Manhattan Melodrama. 1934 Starring Clark Gable. 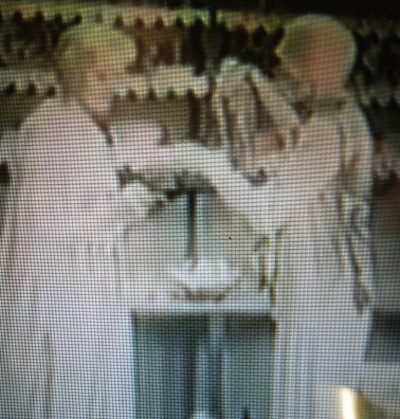 William Powell & Myrna Loy are matched together for the first time. Movie winning an Academy Award for best story. 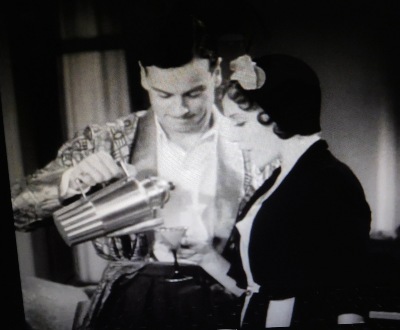 Gable serves a drink to Myna Loy using The Lighthouse Cocktail Shaker. This movie entered the lexicon of history as the last motion picture seen by John Dillinger who was shot to death leaving the Biograph theater on Sunday July 22, 1934. Legend has it that Powell and Loy rehearsed their lines separately and literally met for the first time, cameras rolling, as Powell tumbles into the back seat of the limo holding Loy. The fantastic chemistry between the two is amazing and happens instantly. Director W.S. 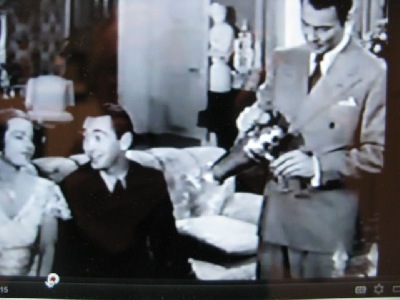 Van Dyke uses the pair for another low budget quicky film -shot in 18 days- The Thin Man, first of the series. 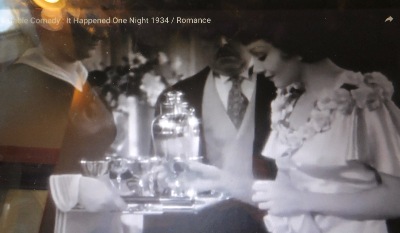 Nominated for a 1934 Academy Award for Best Picture, it lost out to It Happened One Night, staring Clark Gable and Claudette Colbert. NIGHT AFTER NIGHT. 1932 Paramount Pictures. Starring George Raft, & May West in her screen debut. 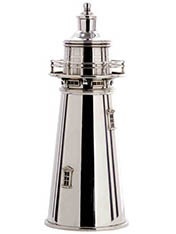 The Lighthouse Cocktail Shaker is seen on a back bar in the night club. 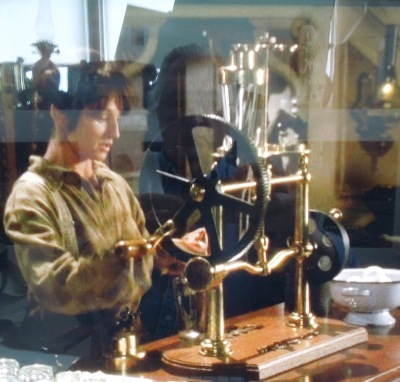 The Lighthouse Cocktail Shaker is in the last two minutes of the movie. 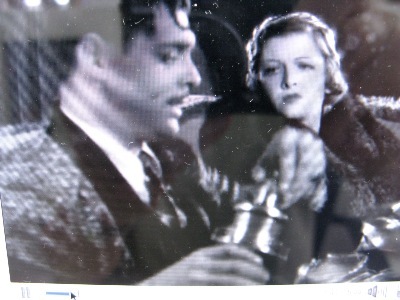 Art Director Cedric Gibbons who must have dearly loved this Lighthouse Cocktail Shaker, it's in so many of his movies. Starring Robert Young, Ann Sothern, Reginald. 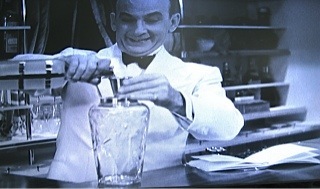 Reginald Owen actually pours from the lighthouse cocktail shaker. Thank you to Ralph Griggs for this. 5.) THE CHAMPION. 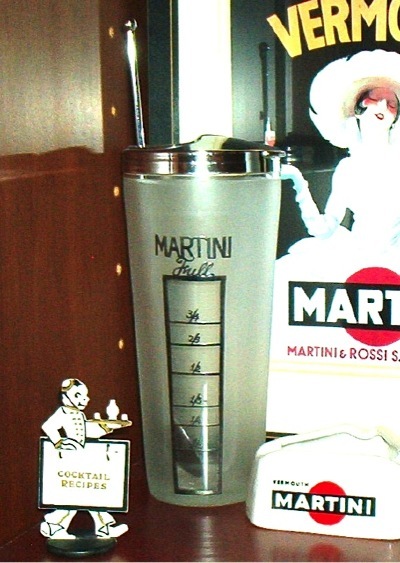 1949 a Hawks skyscraper cocktail mixer is used by the bad girl played by Marilyn Maxwell to stir a Martini for the boxer played by Kirk Douglas. One sip and it's all over for the determined boxer, who then leaves his honest manager and joins the racketeers. 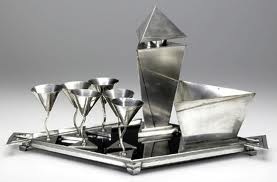 ..In 1940 the Hawks mixer was chosen by the Museum Of Modern Art, New York City, as representing the best in modern design in moderately priced commercial items. 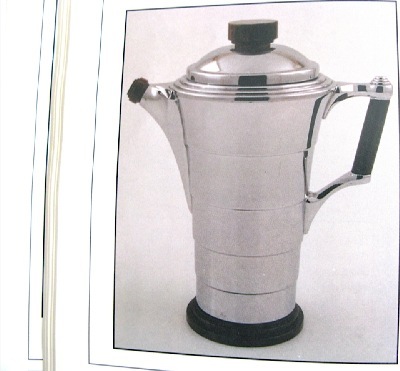 re: page 141 of Vintage Bar Ware book. 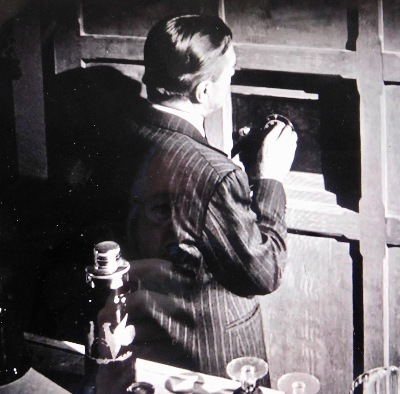 In this movie the top of the long glass stirring rod, a sterling silver top cap is missing. (More as not someone must have dropped this and the top broke off- hence the reason Maxwell is so awkwardly using this stirring rod.) The sterling silver strainer on the bottom end of the rod is still in place. 6.) White Christmas. 1954, Bing Crosby, Danny Kaye, Rosemary Clooney,& Vera Ellen. Watch for the No. 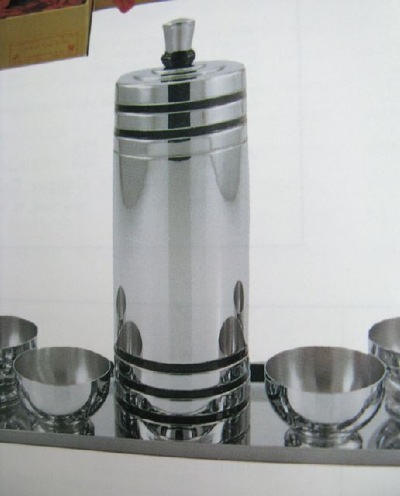 250 Coldseal Aluminum Cocktail Shaker by Kraftware. N.Y.N.Y. 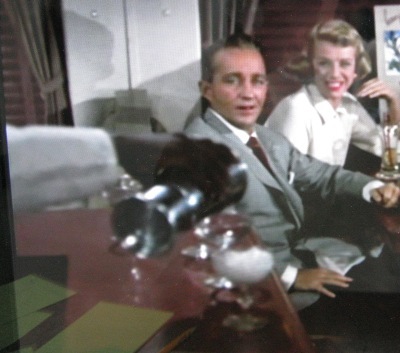 It makes a brief appearance when the four some is in the club car on the train traveling to Vermont, and singing the song "Snow" by Irving Berlin, while the bartender is pouring them a white snowy slush Cocktail. 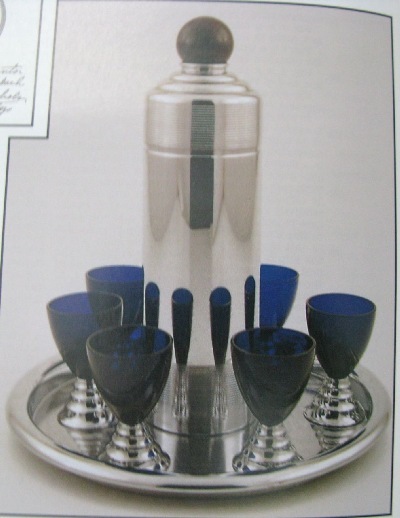 Tho there are four cocktail glasses , the bartender is able to pour only three full drinks from the shaker and the cocktail shot is ended there. 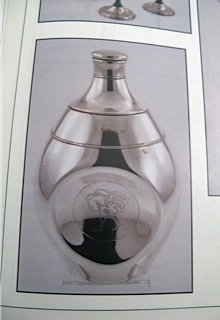 This cocktail shaker is shown on page 200 of the Vintage Bar Ware book. 7.) The Graduate. 1967, Dustin Hoffman, Anne Bancroft. Mrs. Robinson asks Ben Braddock for a ride home, then into the house to the bar. The Swing Cocktail Shaker is on the back bar. 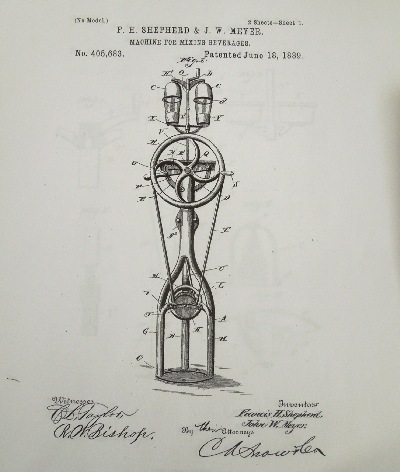 stamped " A.S.Co. 80oz." re; page 108 vintage bar ware book. 9.) The Divorcee. 1930. Norma Shearer & Chester Morris. w/ Shearer winning Best Actress Oscar. 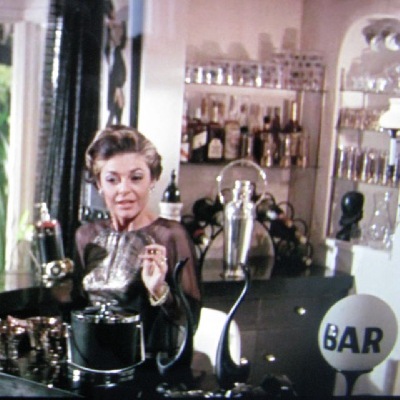 It's 30 mins into the film in the kitchen, it's loaded with cocktail shakers.. -is that the international silver pinch bottle shaker on the shelf ?.. a few shakers there , but you can't miss The Louis W. Rice Stepped Skyscraper, ca. 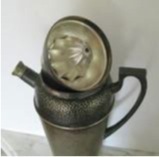 1928, silver plate, with black "tube" handle. 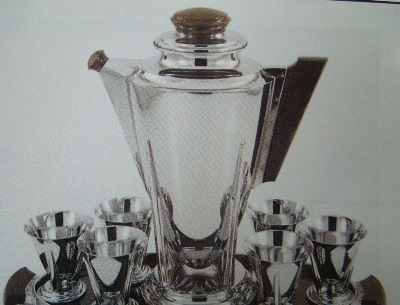 The rare cocktail shaker is in many art deco books, including.. American Modern 1925-1940 page 48. Great book with many shakers, this is the MOMA & John C. Waddell collection. published 2002. 10.) Kiss Me Deadly 1955. Ralph Meeker as Mickey Spillane's Mike Hammer. There are three sizes of cocktail shakers stamped "Wilcox S.P. 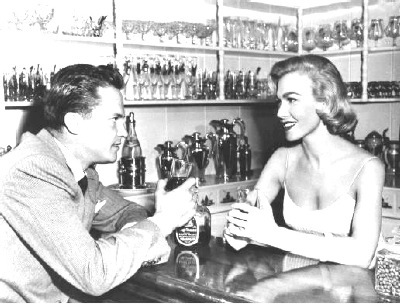 Co." sitting on the back bar shelf, while Ralph Meeker is having a drink with Gaby Rodgers. Wilcox Silver Plate Co. was a division of The International Silver Company, Meriden Conn. Thanks to Jay Hendrickson for #26. # 11.) Charley Chan & The Black Camel. 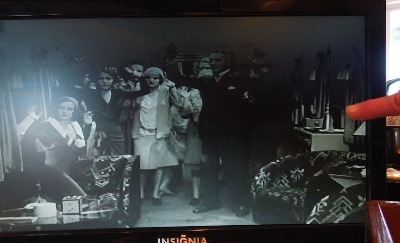 1931 Murder Mystery shot on location in Honolulu Hawaii with Warner Oland, Sally Ellers, Bela Lugosi & Robert Young. Sally Ellers pours cocktails using an Art Deco Manning Bowman, 1928 pre-market crash cocktail shaker, the K128 model, Chrome with Jade Catalin Mounts, is shown on page 60 of the Vintage Bar Ware book. Watch this full movie on you-tube. #13.) The Great Gatsby. 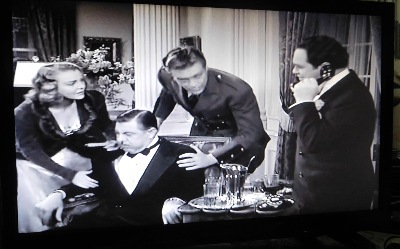 1949 w/ Alan Ladd as Jay Gatsby, Barry Sullivan as Tom Buchanan & Carey Macdonald as Nick Carraway. Sullivan pours cocktails using the Benard Rice & Sons, Inc. cocktail shaker with Juicer in the Top Cap. you can tell by the distinctive top cap and then again when Sullivan removes the top to check the contents you see the point of the juicer inside the cap in his hand. (underside Stamped: PAT'D Sept 30, 1924. APOLLO E.P.N.S. MADE IN THE U.S.A. BY BERNARD RICE'S SONS, INC. 4361) re; example on page 16 of vintage bar ware. #14) A Letter to Three Wives 1949. Jeanne Crain, Ann Sothern, Linda Darnell. Academy Adwards; Best Director, Best Writing. 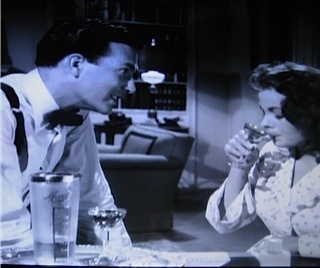 Here Jeanne Crain & Jeffrey Lynn drink a Martini poured from The Martini Cocktail Shaker. 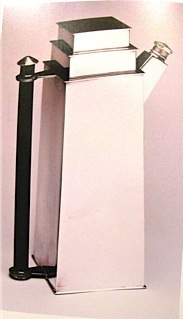 Frosted glass with Sterling Silver Martini overlay, chrome top. Photo of shaker from The Ralph Griggs Collection. For another example in red see page 130 of vintage bar ware. #15) WE'RE NOT DRESSING. 1934 A screwball comedy staring Bing Crosby & Carole Lombard. 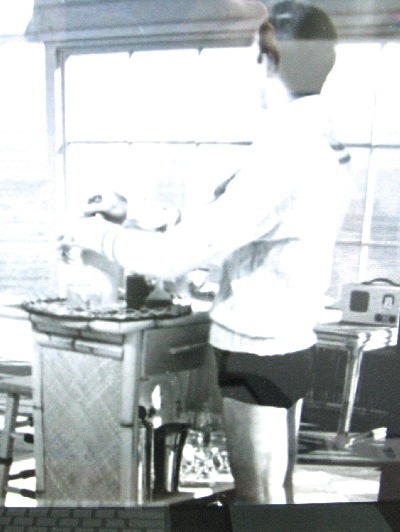 Below... Leon Errol attemts to mix a Yellow Parrot Cocktail for a young Ethel Merman using a Cut Glass Party Size Cocktail Shaker. On the bar we see a Silver Plated Pinch Bottle Cocktail Shaker by International Silver Co. Meriden Ct. Half way throught the scene there Magically appears another silver plated International Silver Cocktail Shaker that Errol uses as a maraca in a dancing number. # 16. MILDRED PIERCE, 1945 Below; The Chase Blue Moon Cocktail Shaker. 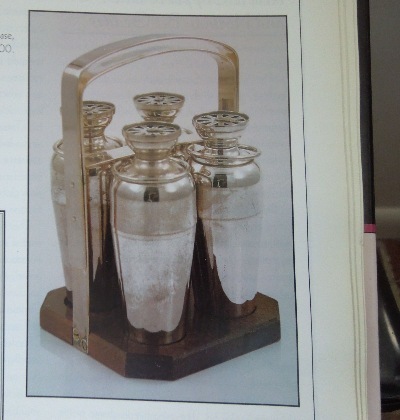 for more about the Chase Copper & Brass Company, see pages 64-71 of the Vintage Bar Ware Book. Joan Crawford won Academy Award for Best Acctress for her role as Mildred Pierce,1945. 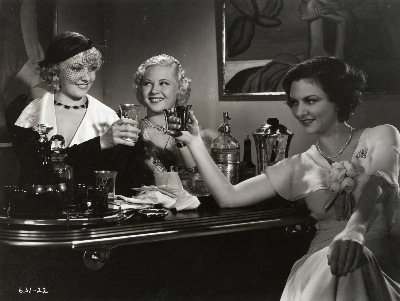 And like any good movie of the era there was a Plethora of Imbibing. 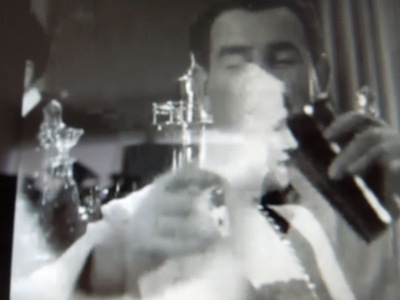 Above; Zachary Scott pours Martinis for Joan Crawford and Jack Carson at the bar of his California beach house. 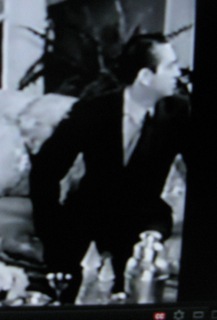 Above; Zachary Scott offers Joan a drink from what looks like a set up bar station in the next room while she is picking out a bathing suit. She accepts. 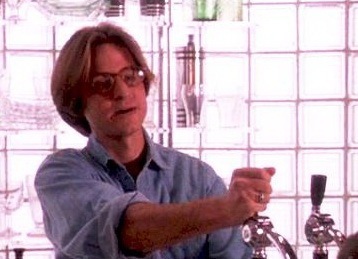 Below; In the next scene that takes place a few minutes later, Scott is mixing yet another drink at a third bar. Behind the bar we see the Blue Moon Cocktail Shaker & The Cocktail Mixer designed by Walter Von Nessen , both produced by Chase Copper & Brass Co.
Paramount Pictures. 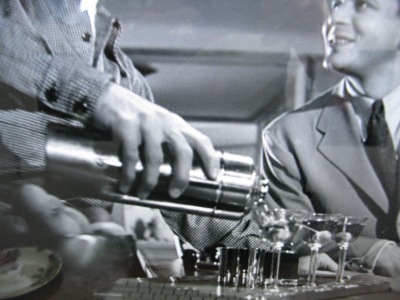 In the first 2 minutes of the movie, Jack Nicholson reaches into his office cabinet & pours Bert Young a drink. We see the Blue Moon Cocktail Shaker on the top shelf. # 17 DANCING MOTHERS. 1926 W/ CLARA BOW .. below. 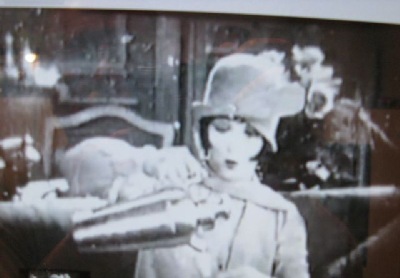 In this scene Clara Bow, with Bobbed Hair, pours herself a Cocktail from an APOLLO BERNARD RICE'S SONS INC. N.Y. Cocktail Chaker and then lights up a Cigarette. Below. Ralph Griggs photo; Apollo Cocktail Shaker by Bernard Rice's Sons. Inc. 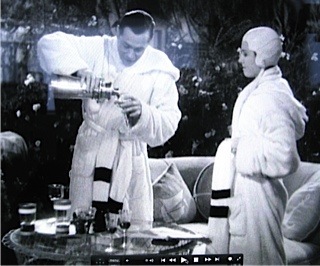 Valet Edward Evertt Horton instructs Douglas Fairbanks the proper way to pour a Cocktail. 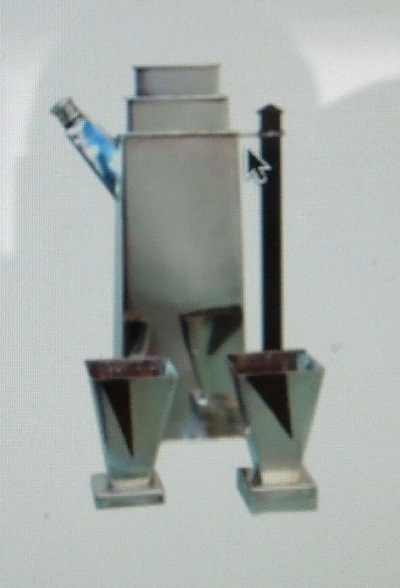 Fairbank is holding a cocktail shaker by the famous American Designer Elsa Tennhardt, silver plate ca. 1928 manufactured by E & J. Brass Co. N.Y. stamped underside pat. 75939. A complete set with ice bucket, tray, 6 cups and shaker sold at Sotheby's N.Y. June 15. 2011 lot #31 catalog NO8754 for $53,125.00...This very same set sold again at Sotheby's on December 13, 2017 for $85,000. with buyers premium the price is $106,250 before taxes..
#19 RED HAIRED ALIBI 1932 Below.. Starring Merna Kennedy & Theodore von Eltz. 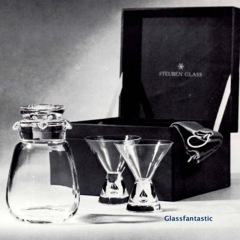 Here von Eltz pours a cocktail for Kennedy using an Elegant Cambridge Glass Cocktail Shaker with Sterling Silver overlay design. Warner Bros Pictures Inc. 1938 Comedy, starring Kay Francis, Pat O'Brien & Ralph Forbes. 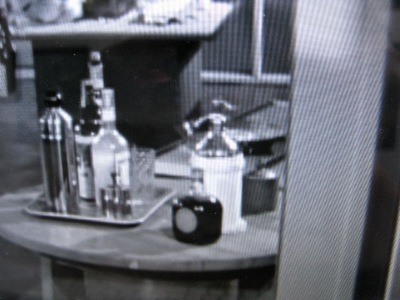 We see the CHASE GAIETY Cocktail Shaker used to pour a cocktail in the apartment kitchen of Kay Francis. The movie is on TCM. Turner Classic Movies and is not on tape or DVD. 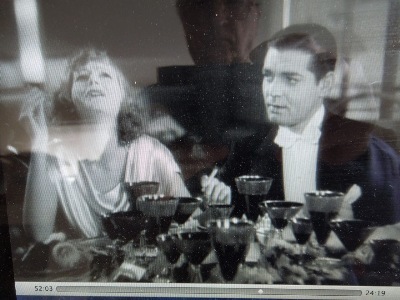 Early pre-code MGM movie, Greta Garbo & Clark Gable. 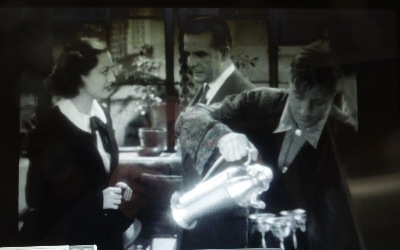 Garbo offers Gable a Martini from one of the two sky scraper cocktail beakers. Looks like a strainer on the bottom of the glass swizzle. 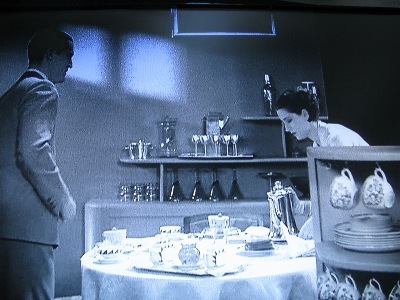 In the next scene: dinner on apartments' outdoor terrace, there is a plethora of serving glasses, either in ruby or cobalt with sterling trim. Cedric Gibbbons Art Director. #22 Women Against Women. 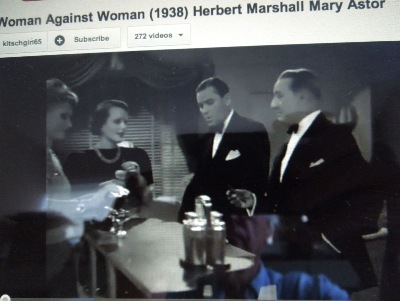 1938 Staring Herbert Marshall & Mary Astor. 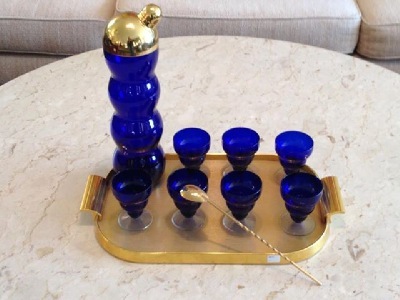 The Foursome cocktail shaker set, by Napier Co., is sitting on the bar. below. # 23 OUR MODERN MAIDENS 1929 MGM Pre Code Silent film starring Joan Crawford. On the train observation car,Joan is traveling with college friends, & the barman is holding a complet cocktail set by Bernard Rice & Sons, ca. 1928. silver plate. Designer Louis Rice. 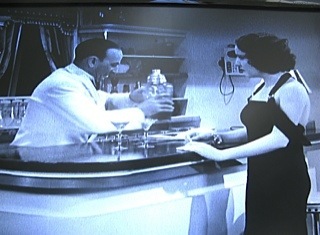 The silent title card is "LUNCH IS POURED". This was Joan's last silent movie. # 23 - A You can see the same cocktail shaker again in THIS MODERN AGE, 1931, when the maids are cleaning up after the big house party. Both are M.G.M. movies with Cedric Gibbons, Art Director. Thanks to Ralph Griggs for spotting this one. # 24 WESTWARD PASSAGE 1932 RKO Pictures . Starring Laurence Olivier and Ann Harding. 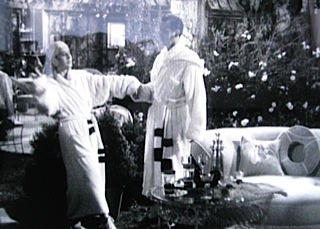 While having cocktails at the bar, Olivier complains to Ann that she is being ogled by the "spanish rake" sitting on the other end. Here is the rake with the Boston Lighthouse Cocktail Shaker. A young & uncredited Turhan Bey. #25 WILD BILL 1995 MGM Studios. Jeff Bridges as Wild Bill Hickok & Ellen Barkin as Calamity Jane star in this under rated movie w/ fantastic cast. Here Ellen mixes a cocktail for Jeff using a studio prop made cocktail mixer based on orignal patents, # 387,634 & 405,683. #26 THE PLAINSMAN. 1937 Paramount Pictures. Gary Cooper as Wild Bill Hickok & Jean Arthur as Calamity Jane. 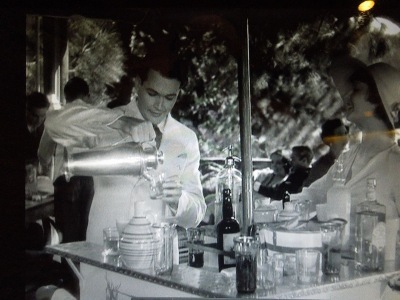 Here Arthur mixes a whiskey, egg & bitters cocktail, with a cocktail machine based on the same patent. RKO Radio Pictures, with William Powell & Ginger Rogers. in Clear, Red, & Blue Glass, by Fostoria Glass Co.
#28 WOMEN LOVE DIAMONDS, 1927. MGM silent. starring Pauline Starke. 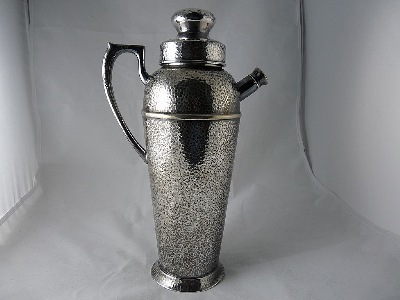 here is Starke w/ a Paisley Pattern Cocktail Shaker by Wilcox Silver Plate Co. Meriden Conn. Thanks to a team effort by members of Cocktail Shaker Collectors Facebook page for identification. 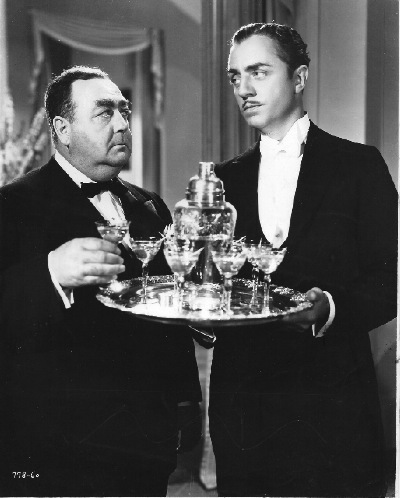 #29 MY MAN GODFREY 1936 Universal Pictures. starring William Powell & Carole Lombard. 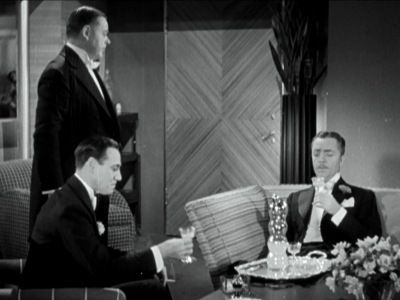 Here Powell serves a Martini to Eugene Pallette, using a Hawkes Crystal Cocktail Shaker and Hawkes Glasses. 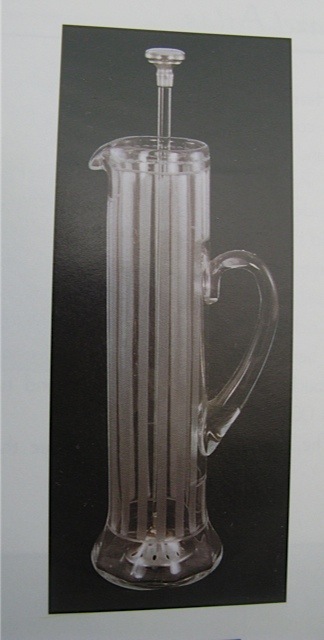 for another example see page 141 , Vintage Bar Ware. Thanks to Michael W Thomas for spotting this one. #30 POSSESSED. 1931 pre code M.G.M. #31 MONTANA MOON. 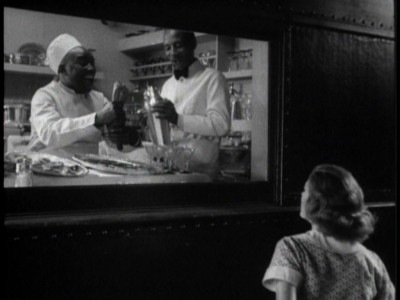 1930 The Lighthouse Cocktail Shaker can be spotted in the last minute of this movie in the train club car. The first singing cowboy feature staring Joan Crawford & Johnny Mack Brown was released by MGM. A wealthy NYC Jazz Age girl meets cowboy home on the range. Not released on DVD at this time. THE LETTER. 1929 & 1940 . 1929 Paramount Pictures, released as a silent film & a talking film in this year. 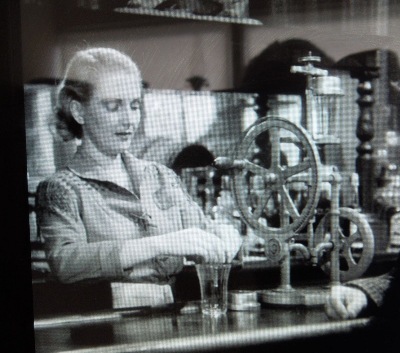 Here famous stage actress Jeanne Eagles as Leslie Crosbie pours cocktails from Party Size plated Cocktail Shaker. -Eagles died just a few months after making this movie and was nominated for an Academy Award, the first to be so recognized by the Academy after her death. A Fantastic movie found on youtube, well worth watching! 1940 Werner Bros. Betty Davis as Leslie Crosbie & Herbert Marshall as the cuckold husband Robert Crosbie. 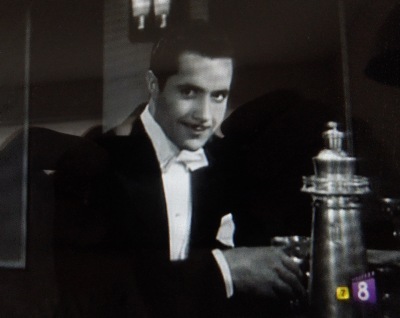 11 years earlier he played the lover of Davis; Goffery Hammond. 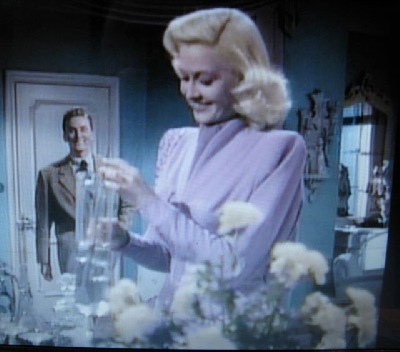 A long scene toward the end of the movie makes use of a striped Hocking Glass Cocktail Shaker with chrome plated top. Davis was also nominated for best actress for her role. Ivan serves cocktails from the MANNING BOWMAN 1928 Mixer Set, Chrome with Jade Catalin Mounts, using the matching cups. re; page 59 Vintage Bar Ware. Paramount Pictures. 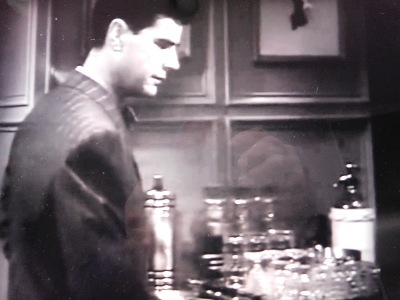 Cary Grant's first movie as leading man. 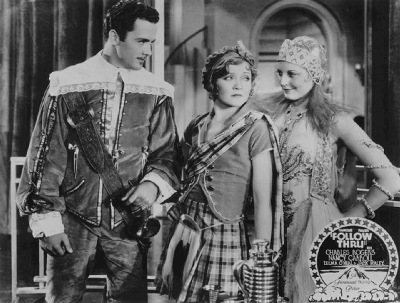 With Nancy Carroll and Randolph Scott. 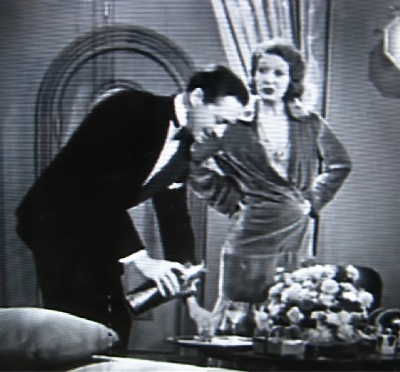 Here actress Lilian Bond is poured a well shaken cocktail from a party size cocktail shaker. stamped on the bottom.. Meriden S.P.Co. International S.Co. Thanks to Collector Ralph Griggs. 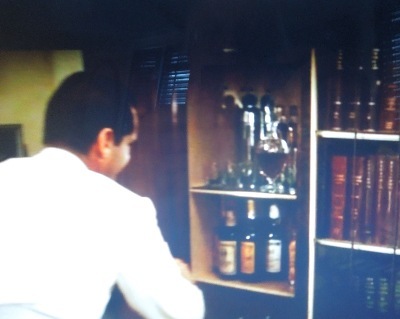 #35 COLOMBO SEASON 8 EPISODE 2 "Murder Smoke and Shadows"
a Chase Gaiety Cocktail Shaker on the shelf behind Fisher Stevens. Thanks to Collector Michael Thomas for spotting this. #36 THE BIRDS, 1963, Alfred Hichock Director. 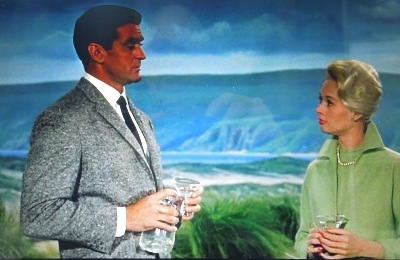 Tippi Hedren is on the receiving end of Martinis from Rod Taylor & his Steuben Glass Wide Mouth, double lip mixer, with Tear Drop Glasses. Thanks to Collector Michael Thomas. # 37 Dirigible 1931. Columbia Pictures. 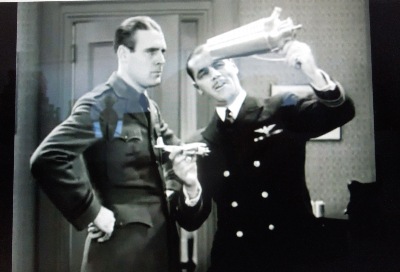 Jack Holt demonstrates to Ralph Graves a mid-air docking/recovery of an aircraft with a dirigible. Actually performed for the movie w/ assistance of the U.S. Navy. Thanks to cocktail shaker collector Brian Crawford for spotting this. 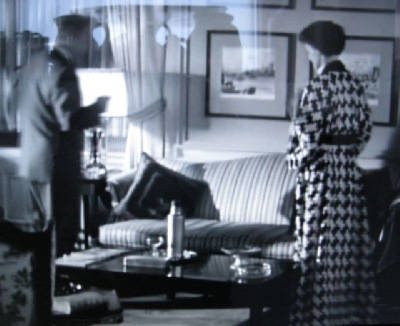 Watching this movie on youtube @ 14:12 minutes in.. we see a 9" Zeppelin Cocktail Shaker on the right side table, it is picked up by a Navy Officer. 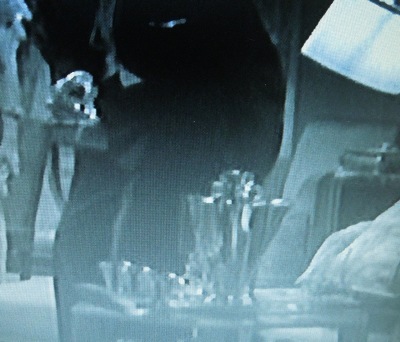 And @ 28:35 minutes into the movie we see a 12" Zeppelin Cocktail Shaker sitting on top of the radio cabinet. 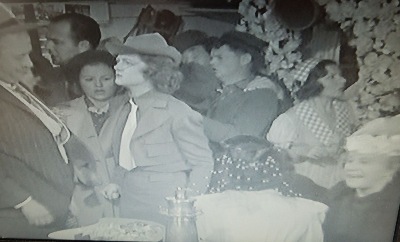 Fay Wray in the foreground. But who made the beehive cocktail shaker & cups pictured? contact us if you know. Thanks to Michael W. Thomas for spotting this scene. Where else can you find two high-end designer cocktail shakers actually used to pour a drink in the same movie. 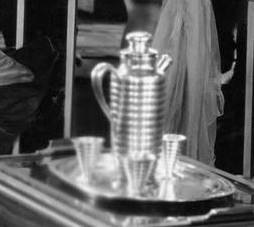 First, Norman Foster pours a cocktail for his movie wife Leila Hayms using a 1928 Kem Weber (Karl Emanuel Martin 1889-1963) designed shaker produced by Friedman Silver Co, NYC. 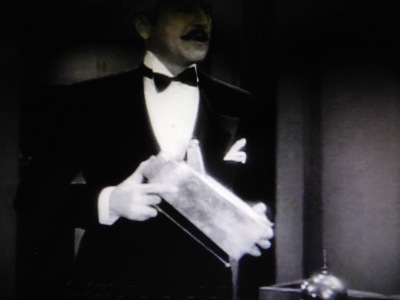 Then interloper Adolphe Menjou pours a drink for Leila Hayms using a 1928 Louis W. Rice (1872-1933) designed stepped back sky scraper cocktail shaker with smoke stack handle produced by Bernard Rice's Sons, Inc, NYC for it's Apollo Studios line. 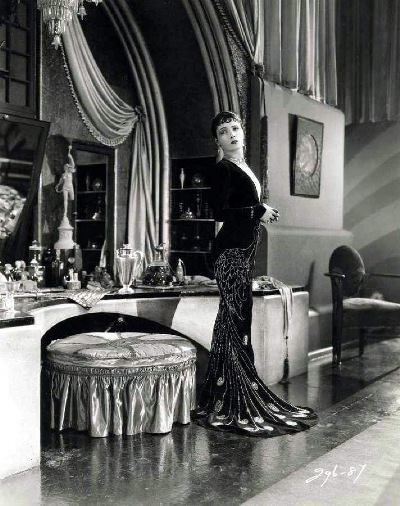 All this thanks to MGM extraordinary Production Set Designer Cedric Gibbons, (1893-1960) The only Hollywood designer to visit the 1925 Exposition de Arts Decoratifs et Industries Modernes, in Paris, and designer of the Oscar statute in 1928. 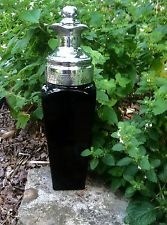 A trophy for which he himself would be nominated 39 times, and winning 11. 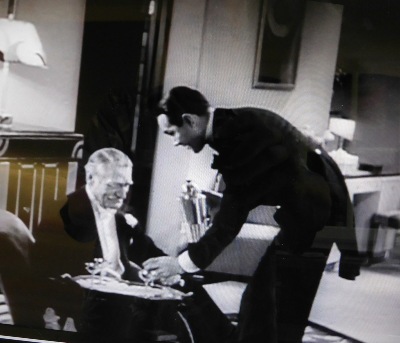 William Haines pours C.Aubrey Smith a cocktail using a Kem Weber skyscraper styled cocktail shaker, in the scene by Production Set Designer Cedric Gibbons. 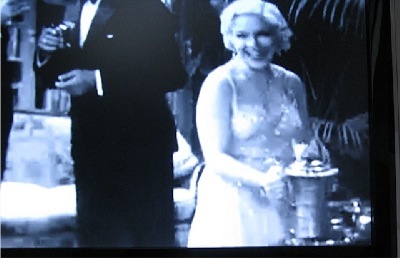 There is a generic tea pot style cocktail shaker at the start of this Racy Pre-Code movie. The Kem Weber shows up half way into the show. Thank you again to shaker collector Ralph Griggs for spotting this. #41. IT HAPPENED ONE NIGHT. 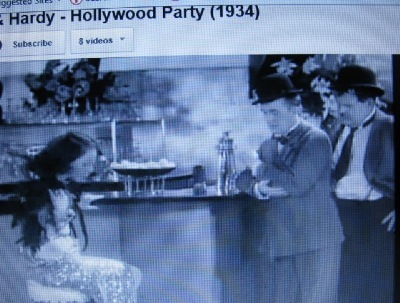 1935, Winner of 5 Academy Awards, w/ Clark Gable & Claudette Colbert. Paramount Pictures, 1928. 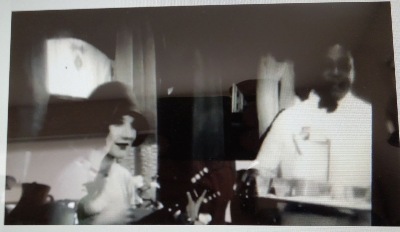 Clara Bow , the IT Girl, with an Apollo Cocktail Shaker by Bernard Rice's Sons Inc.
based on a play by Damon Runyon, staring Edward G. Robinson.